How in the world are you going to make it on your own? The thought is scary at times. You have made the decision to finally move out and live on your own. What will you do now? You will use the internet to gather information to make your move successful. This will help you plan the amount of time, money and experience you will need to achieve your goals of independence. A more detailed list of requirements are in the Process section below. You must choose a job that is within your qualifications. Apartment and transportation must be within your working budget. This means that the budget must be realistic, income must be greater than or equal to your expenses, never the reverse! 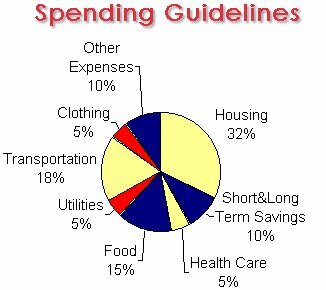 Use the spending guidelines below to help balance your budget. Your progress will be determined upon your ability to carry out the tasks above successfully and realistically. Your ability to function in the "real world" will be assessed by the depth of your results in your budget. The object is to be as real to life as possible, where you can actually use this plan later in life if you choose. Ability to fill out a job application with all necessary information and find employment Student has an application but it's still on the desk. Student has read and filled out the application correctly Student has filled out application correctly and returned it to the employer (teacher) with resume attached. You have been interviewed and hired for a job within your qualifications. You have decided on suitable places to live within your budget. You have searched the Internet for suitable places to live in the community within your budget. You have found your dream apartment that's within your budget and you're ready to move in. You have rented your apartment and balanced your budget well enough with money left over for utilities and food. You have consulted the newspaper or internet for transportation that fits your budget. You have searched the Internet for suitable transportation within your budget. You have located transportation that is within your budget and you're ready to purchase it. You have reliable transportation to get to and from work within your budget. Ability to create and use a balanced budget You have constructed a graph or plan for your budget that is realistic. You have prepared a budget using your projected income from your new job. You have prepared a realistic budget with information that includes your income and expenses in detail. You have created a budget plan that allows you to live within your means and have money available for savings. Ability to write checks for bills and balance a check book correctly You are able to write a check correctly. You are able to write a check and keep good records of transactions. You are able to manage your checkbook receipts and keep a positive balance in your account at all times. You are able to do the things in the last two columns plus read and interpret your bank statement and balance the checking account at the end of the month. You will learn the importance of planning for your future. You will learn how to search for the right job, apartment, transportation and budget that are all right for you. Keep in mind that your education level is a key factor in the kind of job that you are able to obtain. Here are some links to resources that might be useful in your search. Any web sites that you find that are suitable for this assignment can be submitted via email for the use of future students. Thanks go out to all the Internet resources that made the research and completion of this project possible. I also want to recognize my children, Stuart, Amanda and Amber, for giving me the inspiration and urgency to compile this information in an effort to help all children succeed in life skills.